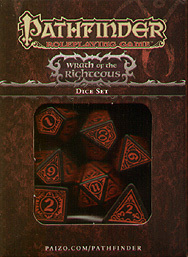 Paizo Inc. and Q Workshop are proud to bring yuo the 100% official Pathfinder Wrath of the Righteous Adventure Path dice. Each of these 7 (d4, d6, d8, d12, d20, d10 and 1 percentile die) dice bear markings suggestive of a crusader's courage and righteous might. Roll the dice and learn whether you'll live to complete our quest!